The dealer would be advised to arrive at the appointed hour, clean and, if possible, sober. He or she would be advised to avoid lunchtime as they may be asked to eat a meal which can establish a bond that makes it harder to turn the books down flat when they are poor stuff, which, sadly, is often the case. This bond could work in your favour - especially if the books are great and you are possessed of basic social skills and decency. However if you are anything like me the first thing you would want to do is look at the books and find treasures. Not a good idea to bring price guides as they can be seized by the seller and through misinterpretation be used against you. The best bet these days is to bring a cellphone and if stumped for prices or edition points etc., to "phone a friend" - hopefully one hooked up to the web and services such as ViaLibra.com, abebooks and ABPC. When making an offer it is best to announce it confidently. As a very general rule of thumb it should represent about 40 to 60% of what you might eventually hope to realise for the books depending on their quality and how fast they will sell. It is worth leaving a little 'wiggle room' as sellers often like to drive a price up. Honesty is, of course, the best policy and a dealer who immediately doubles his offer on rejection or increases it dramatically is likely to reveal himself as a swine and a blackguard. In the case of lower price books where it takes longer to get a return a third or a quarter or less might be appropriate. It is generally best if possible to 'pick' and not be lumbered with undesirable books. Try to leave behind the 'dogs' and if forced to take the lot back out unless its really worth it, nowadays too much crap is a terrible burden. If you have to outbid some other dealer do not be afraid to ask what has been offered (half the time people will tell you) if it is too much do not top their offer but make a dignified exit and express an interest at a lower price if the deal with the other guy (possibly some extravagant, fly by night chancer or even a general clearance dealer ignorant of book values) falls through - and they often do. If you find you have (mentally) grossly exceeded the offer of another it is often worth looking at the books again in case you have overrated something (and vice versa.). Don't think because the seller seems to like you that they won't sell to another. Do not worry if you don't get the books--the world is full of them. 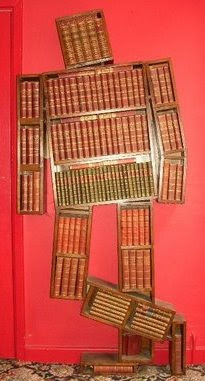 'Bookman' shelf above by East Anglian artist Kazmierz Szmauz. I haven't used the bobbing boat yet ! Where do you get a load of strong,cheap students these days ? I've always had to pack & move 5,000 plus books all by self ( 4th floor flat,& a parking ticket ). Speaking of buying a house load of books,you could also add the problem of the nervous sellers asking you to pick out the top books you are paying the most for,then dishonestly hiding them elsewhere in the house,while you pack the rest of the dogs in boxes.You only discover this mishap upon unpacking the books weeks later.i.e. After paying for them ! The same thing happens when you return to buy a previously viewed collection,only to find relatives have picked out the better ones and packed everything else in boxes.Or what about requests from sellers to list their entire collection for sale with prices you are offering by each.Do you camp out in the attic for a week with a typewriter ? Or why are sellers reluctant to sell,common titles, to a dealer for a nominal price per book,but will happily donate them all to Oxfam,instead ! Have any dealers introduced a call out charge ? often i drive 50 miles to find the treasured book horde is 20 Readers Digest & a complete Charles Dickens from 1889.etc. Or what do you do if the seller has called several dealers all to arrive at the same time ! Thanks Pontus - brother of the book! Been there, done that. Fit students are got by knowing just one and mentioning £10 an hour and a decent meal--they can usually find a few other mates and layabouts. When a seller starts getting ideas about cataloguing the lot we are out of there unless the books are something like William Beckford's own library or JK Rowlings marked up collection of books on wizardry. There are more literary descriptions of house calls in Umberto Eco's The Mysterious Flame of Queen Loana. 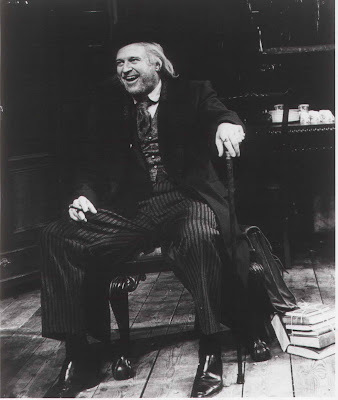 The protagonist is a rare book dealer and sometime philanderer losing his mind or perhaps regaining his childhood in old age, and it contains a mishmosh of allusions from very low to very high culture, comic books to Joyce. As the link indicates, I thought the novel interesting but didn't love it. My books are packed up at the moment,—I'm about to move from Seattle to Tucson to start grad school—otherwise I'd quote from it. £10 an hour and a good meal! Count me in! And I box books with tlc.